After a brief introduction to the "analogy argument" of John Calvin, it is time to let him address his objects. Without a doubt it takes a great exegetical skill to handle the objections since they develop from many different Biblical books and authors. This actually was crucial to my conversion from the believer baptism to infant baptism view. After lengthy study, I simply felt that the whole of Scripture is emphatic about the covenants. And from the covenant the promises, signs and families. I found all of these themes including the Gentiles in the gospel (Eph 2:11-18). The gospel didn't overturn the promises to Abraham, Isaac and Jacob. No, they became our fathers and we inherited their covenants. So while many of the exegetical arguments for Believer Baptism are good, I found them to be lacking the whole context of Scripture and the natural cohesion I saw in Covenant Theology. 3624) which is used to describe who was baptized is the same word used in the LXX to describe who should be circumcised by Abraham (τῆς οἰκίας σου). This included not only babies born of the father's seed but even those birthed of the slaves. Reading this back into the NT, it seems quite clear that the writers were communicating a defense of communal commitment to the covenant just like God commanded Abraham. The writers would never emphasis "infant baptism" when it was an obvious cultural and theological point to include "the household" in the covenants. until they refuse the law and covenant. I am leaving out my more arguments simply due to length purposes. Those interested in reading fuller arguments will surely be able to find support both for and against these arguments. 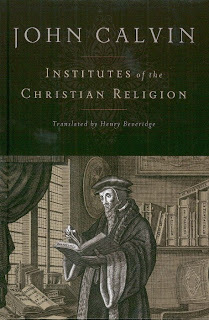 The whole of John Calvin's Institutes can be downloaded in PDF and MP3 (!!!) form or borrowed from the Torrey Library.